The sign reads clearly Knickerbocker Boarding, but there never seems to have been a stable at this location by this precise name. The nearest I have been able to identify is the New Knickerbocker Boarding Sale and Exchange Stable located here approximately 1915 to 1916. It is quite possible that one of the earlier stables in this building was called the Knickerbocker, although it does not appear under this name in directory lists. The earliest I found was the Mauder Bros. Stable at 310-312 E. 11th St. from 1902 to 1906. The Mauder brothers were Herman Mauder and Louis Mauder. Before his partnership with his brother, Herman Mauder was proprietor of a livery stable at 181 Christie St. from 1890 to 1897, then at 14 2nd St. from 1898 to 1902. In 1906/07 ownership passed to Hugh J. Commuskey. Hugh Commuskey owned the stable at 310 E. 11th St. from 1907 to 1914. In its later years this was known as the Imperial Stables. Hugh J. Commuskey was a member of the Board of Aldermen of Greater New York City in the early 1910s, and he appears in both the New York State census of 1925 and the U. S. Census of 1930. In 1925 Commuskey was 51 years old and gave his occupation as "real estate." In 1930 he was 56 and worked as "Elect Insp Dept of Courts." Trow's New York City Copartnership Directory for 1914 listed Hugh Commuskey as a director at Imperial Stables, but had the following for company officers: Edward Marx, pres. ; Louis Marx, sec. ; and Isaac Marx, treas. A year later the 1915 issue of the same copartnership directory listed "Imperial Stables (N. Y.) dissolved" and "New Knickerbocker Boarding Sale and Exchange Stable (Morris Fein)" at 310 E. 11th St.
Around 1920 Morris Fein and the New Knickerbocker stables were replaced by L. Sherman & Son. Louis Sherman (1867?-1931) was owner of a stable at 433 E. 12th St. from around 1907 to 1919. Initially, this business was a partnership between Louis Sherman and Samuel Gore, known as Sherman & Gore. Sherman & Gore also operated stables at 413 E. 10th St. and 525 E. 11th St. By 1911 Sherman & Gore were replaced by L. Sherman & Son at 433 E. 12th St., where the son was Louis Sherman's eldest son, Benjamin Sherman (1889-1972). Around 1913, Benjamin Sherman became involved with Berdan's Fulton Stables at 264 W. 11th St. (near West 4th St.), which had a branch at 97 Greenwich St. (downtown near Rector St.). Benjamin Sherman registered for the World War I draft in 1917 when he lived at 15 W. 110th St. and was in business for himself with a livery and trucking business at 264 W. 11th St. Between 1918 and 1923 Benjamin Sherman's boarding stables were located at 136 W. 4th St. A few years later (1926) Benjamin Sherman founded a vending-machine business that was very successful. His obituary, New York Times, 16 June 1972, read in part, "Mr. Sherman, a native New Yorker, went from public schools into the trucking business. In 1926 he acquired a chain of motion-picture theaters..." After Benjamin Sherman, the son at L. Sherman & Son became Harry Sherman, (1895-?) another of Louis Sherman's sons. Harry Sherman, age 22, registered for the World War I draft in 1917, when he gave his occupation as "Stable Manager, L. Sherman, 433 E. 12th St." L. Sherman & Son took over the stable at 310 E. 11th St. in 1920. Harry Sherman and Louis Sherman were owners during the final years when the building housed a stable (1920-1925). In 1925 310 E. 11th St. became the Clear View Garage, a parking garage for cars. A sequence of name changes followed. Primary among these was the Heitmin Garage from 1931 to 1979. Heitmin was Louis Heitmin. Polk's 1933-34 New York City Directory listed Louis Heitman, sec-treas, and Marcus Bader, pres, at Heitman Garage Inc., 310 E. 11th St. (Several early listings spelled the name Heitman; most gave it as Heitmin.) 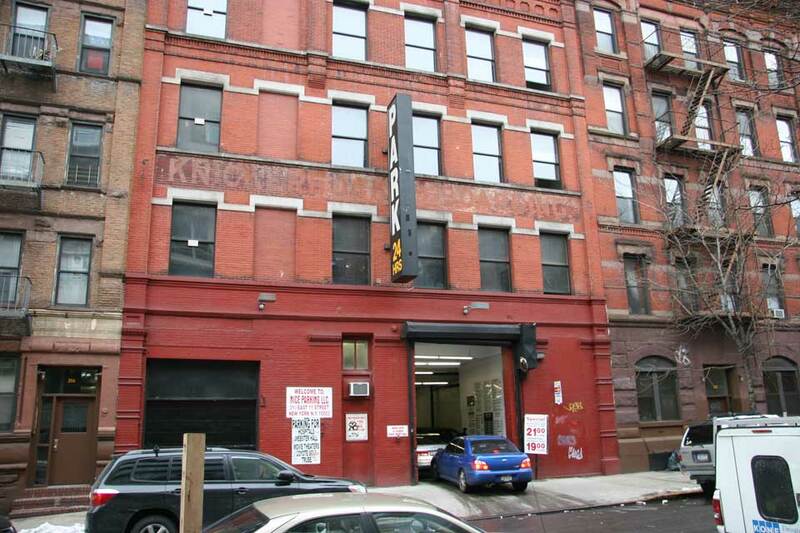 In 1943, the New York Sun, 9 July 1943, reported, "St. Mark's-in-the-Bouwerie Church has sold the five-story garage building at 310-312 East 11th street, a site which it has held in continuous ownership since November, 1801, to an investing client of Dodge & Saltzman. At present occupied as the Heitmin Garage, the property was sold with the church's taking back a purchase-money mortgage of $45,000, according to David J. Colton, who represented the seller in the deal. It occupies a 48.4 x 94.10 plot situated between Second and First avenues. The 1943-44 assessed value is $50,000." From 1996 to 2002 310 E. 11th St. was part of the Kinney System of parking garages. Currently, 2012, this is Nice Parking Corp. under Park-It Management, 212-475-5262.